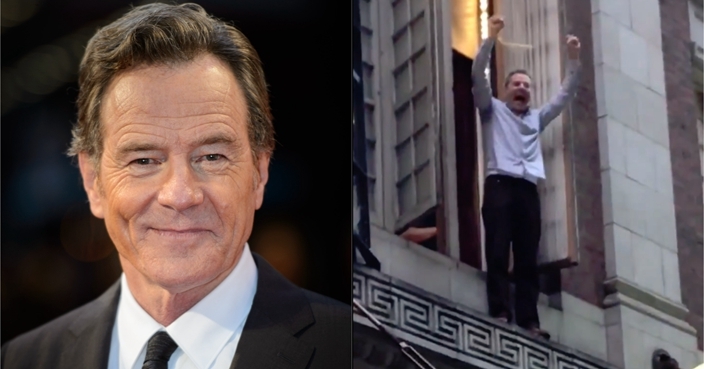 Breaking Bad actor Bryan Cranston climbed out of a window on to a small ledge to cheer the crowds gathered in New York for the Women’s March 2019. The movement saw thousands across the world take to the streets to make a public stand for equality and justice, and Cranston said the crowd outside the Belasco Theatre was “exciting to witness”. Many shared footage and images of Cranston standing on the ledge outside the Broadway theatre, where he is performing his Olivier Award-winning part in the play Network. The 62-year-old shared a video of his view from the thin balcony, which showed a street packed with warmly-wrapped peaceful protesters and their signs. The Women’s March is an annual campaign now in its third year since it began in Washington DC in 2016. The first march took place on the day after Donald Trump’s inauguration and took a similar path to the US presidential event as a form of protest towards his policies and views, which have been deemed anti-women.